When calcium salts are deposited in an unorganized fashion in soft tissue, it is called heterotopic calcification, which is divided into three categories: Metastatic, idiopathic and dystrophic. When the serum levels of calcium or phosphate increase, minerals precipitate into normal tissue causing metastatic calcification, , which usually occurs bilaterally and symmetrically. However, idiopathic calcification occurs in soft tissues even when there are normal serum calcium and phosphate levels. Dystrophic calcification is pathologic and occurs in degenerative and dead tissue despite normal serum calcium and phosphate levels, soft tissue damage caused by trauma, inflammation, injections, presence of parasites, changes arising from disease and calcifications localized to the site of injury. Calcification of various structures located in the head and neck region are detected accidentally on panoramic radiographs (OPGs) during routine examination of patients seeking dental care. Prevalence of soft tissue calcifications is fairly common and these should be identified to distinguish innocuous lesions from pathologies. Important criteria to be considered are the anatomic location, number, distribution and shape of the calcification. Studies done by Mansour et al. indicate that 4% of soft tissue calcifications are detected in OPGs. Khan et al. reported that 35% of patients had some form of soft tissue calcifications in the maxillofacial region in studies done on computed tomography. Several studies have reported that carotid artery calcifications comprise a fairly greater amount of calcification. They also indicate that they can be used in the identification of soft tissue calcifications. Hence we felt the need to do a retrospective hospital-based study on prevalence of soft tissue calcifications visible on digital OPGs. To estimate the prevalence of soft tissue calcifications seen in digital OPGs. 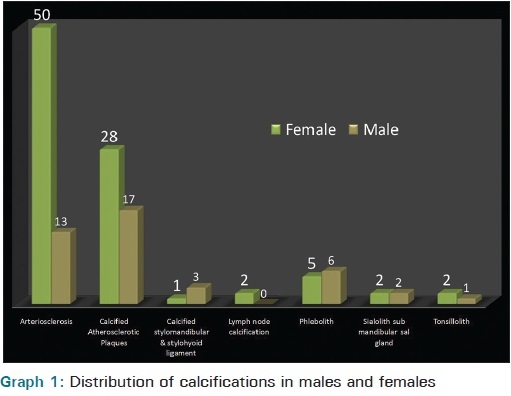 To estimate and compare the prevalence of calcifications in males and females. To estimate prevalence of arteriosclerosis and carotid artery atheromas seen in digital OPGs. To evaluate incidence of arteriosclerosis and coronary artery atheromas in digital OPGs. To evaluate incidence of tonsillolith, sialolith, phlebolith, and lymph node, stylomandibular ligament, stylohyoid ligament and any other soft tissue calcifications seen in digital OPGs. Digital panoramic radiographs, taken on the Sirona Orthophos XG5, of 1615 adult dental outpatients who had visited the dental college were scrutinized for calcifications. The radiographs were of 959 males and 656 females. The patients with hyperparathyroidism, malignancy and renal failure were excluded from the study. All the rest of the patients were included. 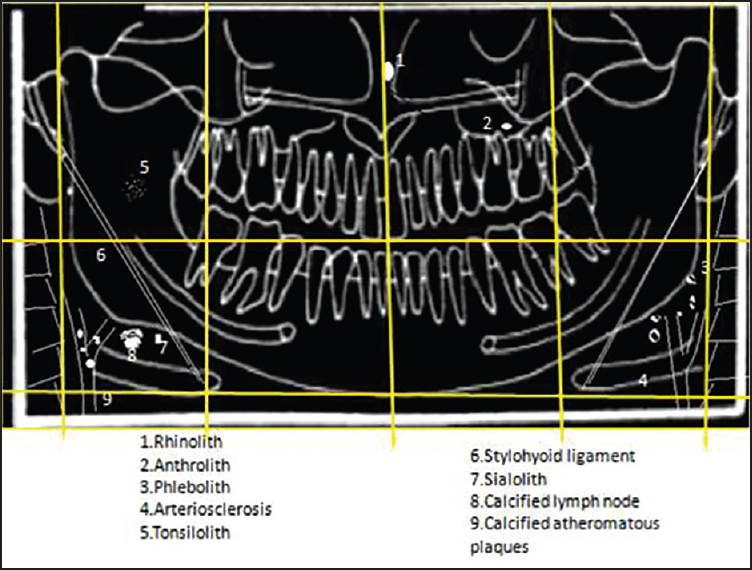 Calcifications were classified according to the site, number, distribution, shape and appearance and they were categorized by dividing the panoramic radiograph into 12 boxes arbitrarily, by a line drawn horizontally across the occlusal plane and another line drawn parallel to it along the lower border of mandible. Vertical lines were drawn along the posterior aspect of the ramus on both sides and along the center followed by two other additional vertical lines drawn in between them. Accordingly, the OPG was divided arbitrarily into 12 boxes and numbered 1-12 as shown in [Figure 1]. Calcifications were recorded taking their anatomical site and the box in which they appeared into consideration [Figure 2]. Following criteria were used to identify different types of soft tissue calcifications. Calcification was identified as a rhinolith if it was found in the third or fourth box on the medial aspect. Calcification was identified as an antrolith if it was found in the antrum of the maxillary sinus in the third or fourth box. Calcification was identified as a phlebolith if it appeared as small, multiple concentric radiolucent and radiopaque rings, with the internal aspect homogenously radiopaque, giving a bulls eye or target appearance. This was confirmed if present in the 8 th or 11 th box. Calcification was identified as arteriosclerosis if it appeared as a parallel pair of thin radiopaque lines that had a straight/tortuous path involving the facial artery or the Carotid artery. This was confirmed if present in the 8 th or 11 th box. Tonsilloliths are dystrophic calcifications as a result of chronic inflammation of tonsils. Calcifications were identified as tonsilloliths if they appeared as unilateral and multiple small radiopacities clustered together over the oropharyngeal air space, with or without overlapping the ramus. This was confirmed if present in the 2 nd or 5 th box. Calcification was identified as sialolith in the duct of the submandibular gland when it appeared cylindrical and very smooth in outline, single or multiple in number, and in the hilus, when they appeared larger and more irregularly shaped. This was confirmed if present in the 2 nd or 5 th box. Calcification was identified as calcified stylohyoid ligament if it appeared as a linear ossification extending forwards from the region of the mastoid process and crossing the posterio-inferior aspect of ramus toward the hyoid bone. The ossified ligament was straight in outline and in some cases irregularity was seen in its outer surface. The calcification was considered a calcified stylohyoid ligament, if it started from the 6 th box extending to the 11 th box or from the 1 st to 8 th box. The most common location was the submandibular region at or below the inferior border of mandible near the angle. Calcification was identified as calcified lymph node affecting a single node or a series of nodes, when they appeared with a well-defined and irregular periphery with a lobulated appearance, similar to the outer shape of a cauliflower. It was considered if present in the 8 th or 11 th box. Calcification was identified as atheromatous plaques when visible in the external carotid vasculature, superior or inferior to the greater cornua of hyoid bone and adjacent to the cervical vertebra, C3, C4 or the intervertebral space between them. It was considered if present in the 8 th or 11 th box. All the radiographs were taken in a digital radiographic unit. The data was entered into Microsoft Excel. Out of the 1615 patients whose radiographs were viewed for evidence of calcification, the number of radiographs with evidence of calcification was 155. Two maxillofacial radiologists with more than 8 years of experience in the field examined the radiographs for calcifications. After inter-examiner correlation, 23 radiographs were ruled out and it was found out that the number of radiographs with evidence of calcification was 132 (8%). Out of the 132 radiographs, 90 were radiographs of females and 42 of males [Graph 1 [Additional file 1] ]. Ages ranging from 14 to 80 years were examined. 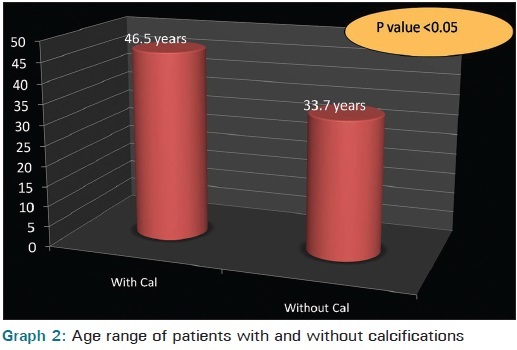 Mean age of participants with calcification was 46.5 ± 13.8 and mean age of participants without calcification was 33.7 ± 18.35 with P-value <0.05 (Mann-Whitney U test) [Graph 2 [Additional file 2] ]. 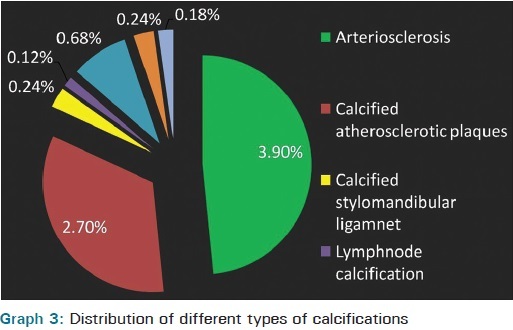 In the present study majority of the patients were identified with arterial calcification which comprised 63.41% arteriosclerosis and 45.29% calcified atherosclerotic plaques. Also phlebolith in 11.7%, sialolith of submandibular salivary gland in 4.3%, calcified stylomandibular and stylohyoid ligament in 4.2%, tonsillolith in 3.2%, and lymph node calcification in 2.1% of the radiographs, was found [Graph 3 [Additional file 3] ]. Our findings also showed that women of older age groups (>45 years) had more carotid artery calcifications i.e., 60, when compared to the younger age group (<45 years) i.e., 18. However, males above 45 years and below 45 years did not show much difference [Graph 4 [Additional file 4] ]. Soft tissue calcifications are fairly common in OPGs, but they are most commonly detected incidentally because they do not cause any signs or symptoms. Many of the structures in the head and neck region are in close proximity to one another which makes localization and identification difficult. 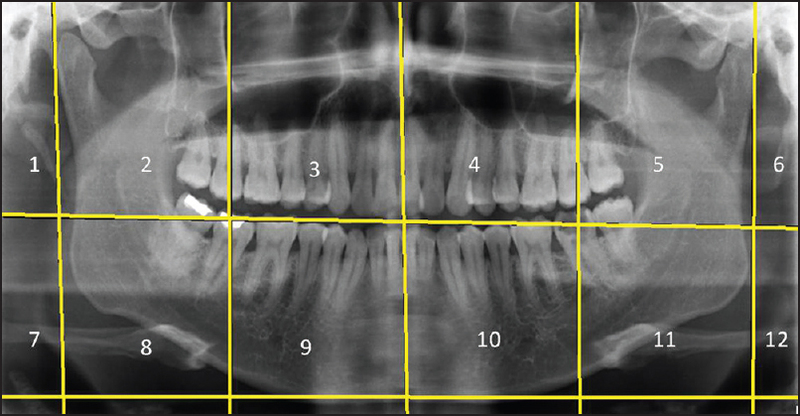 In addition, detection and confirmation is complicated on conventional extraoral dental images due to the fact that most radiographic images in dentistry are planar, that is, provide a two dimensional (2D) representation of a three dimensional (3D) object. This potentially results in both false positive and false negative detection of various calcifications and the clinician has to seek more diagnostic information, refer to a physician, or confirm it by adopting newer diagnostic methods. In our study we detected higher prevalence of soft tissue calcifications (8%) as compared to the study done by Mansour et al. (4%). Among the various soft tissue calcifications analyzed in our study, the highest incidence was observed for carotid artery calcification. Previous studies reported a 2-11% prevalence rate of carotid artery calcifications in the dental patient population in a hospital based study, almost in agreement with the results of our study. In a study by Dov et al., the mean age of the people in the final positive count was 64 years, with a range of 55-84 years. In a study done by Ohba et al. for evaluation of carotid artery atheromas detected by panoramic radiographs among 80-year-old individuals, 659 radiographs were obtained of which 33 were noted to have carotid artery atheromas, eight in males and 25 in females. Previous studies have stated that the incidence of atherosclerosis is more in men than in women because, female hormones have a protective effect thus reducing prevalence in them. However, this effect is absent after menopause. Main causes of atherosclerosis are hypertension, diabetes mellitus, smoking, obesity, advanced age, improper diet, high stress, inadequate blood supply, and lack of physical exercise. In a 5-year study done in 1604 patients by Dominic Inzitary et al., they stated that the risk of stroke in atherosclerosis of carotid artery is 8%. Browner et al. reported 74% mortality due to stroke in women. Friedlander reported 60% of deaths in post-menopausal women occuring due to stroke. Taguchi et al., Bonithon-kopp et al., Evelyn O Talbott et al., and Matthews et al. have done studies on prevalence of arteriosclerosis in women and found there was an increased incidence in women between 45 and 60 years of age. ,,, Studies have demonstrated an increased risk of extracranial carotid calcifications in women after menopause. This was in agreement with the results of our study. Several factors such as stress, hypertension, hormonal variations and decreased bone density are related to this. The most common cause of death worldwide is coronary heart disease, cancer, and stroke. Asians have a lower rate of coronary heart disease and a higher prevalence of stroke. In India age-adjusted prevalence rate of stroke was between 250 and 350/100000 of the population. Hypertension is the most important risk factor. Stroke represents 1.2% of total deaths in India. The dentist could be the first person to detect impending signs of atherosclerosis on routine radiographs or radiographs taken for various dental reasons. Atherosclerosis is an insidious disease, often providing few signs and symptoms before life-threatening catastrophic consequences ensue in the form of a stroke. Hence, the dentists' careful evaluation of the OPG might be instrumental in saving a patient's life. Patients demonstrating possible carotid artery disease can be followed up with another better view. This would also make the OPG which is a widely used imaging tool for diagnosing dental status an economical tool for timely advice on the patient's medical health. Majority of the calcifications encountered in the present sample were carotid artery calcifications (carotid arteriosclerosis and atherosclerotic plaques) compared with other soft tissue calcifications. It was concluded that panoramic radiography can be used as a tool to detect calcifications in the common carotid artery. 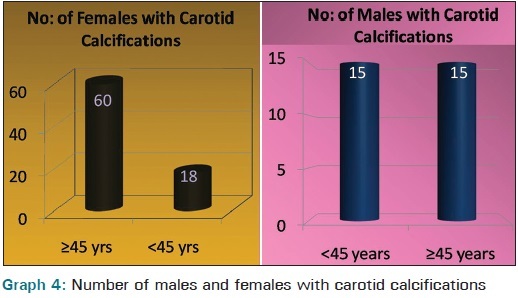 Females had almost twice as many carotid calcifications than males. Digital panoramic radiographs can serve as economic diagnostic tools for initial diagnosis of atherosclerotic conditions. Though we can accidentally detect the calcification in a radiograph which was taken for dental use, we cannot estimate the risk of stroke with the incidental finding of carotid artery calcifications on panoramic radiography only. Better designed studies should be done that report the result of long-term follow-up among patients with carotid artery calcifications compared with those without carotid artery calcifications. Further research is warranted before any suggestions can be made regarding detection of carotid artery calcifications on panoramic radiograph. de Moura MD, Madureira DF, Noman-Ferreira LC, Abdo EN, de Aguiar EG, Freire AR. Tonsillolith: A report of three clinical cases. Med Oral Patol Oral Cir Bucal 2007;12:E130-3. White SC, Pharoah ML. Soft tissue calcification and ossification. Oral Radiology: Principles and Interpretation. St. Lopuis: Mosby; 2000. p. 552-65. Mansour PA, Romanuik K, Hutchings RD. Soft tissue calcifications in the differential diagnosis of opacities superimposed over the mandible by dental panoramic radiography. Aust Dent J 1991;36:94-101. Hubar JS. Carotid artery calcification in the black population: A retrospective study on panoramic radiographs. Dentomaxillofac Radiol 1999;28:348-50. Yoon SJ, Yoon W, Kim OS, Lee JS, Kang BC. Diagnostic accuracy of panoramic radiography in the detection of calcified carotid artery. Dentomaxillofac Radiol 2008;37:104-8. Friedlander AH, Friedlander IK. Identification of stroke prone patients by panoramic radiography. Aust Dent J 1998;43:51-4. Almog DM, Tsimidis K, Moss ME, Gottlieb RH, Carter LC. Evaluation of a training program for detection of carotid artery calcifications on panoramic radiographs. Oral Surg Oral Med Oral Pathol Oral Radiol Endod 2000;90:111-7. Ohba T, Takata Y, Ansai T, Morimoto Y, Tanaka T, Kito S, et al. Evaluation of calcified carotid artery atheromas detected by panoramic radiograph among 80-year-olds. Oral Surg Oral Med Oral Pathol Oral Radiol Endod 2003;96:647-50. Taguchi A, Suei Y, Sanada M, Higashi Y, Ohtsuka M, Nakamoto T, et al. Detection of vascular disease risk in women by panoramic radiography. J Dent Res 2003;82:838-43. Inzitari D, Eliasziw M, Gates P, Sharpe BL, Chan RK, Meldrum HE, et al. The causes and risk of stroke in patients with asymptomatic internal-carotid-artery stenosis. North American Symptomatic Carotid Endarterectomy Trial Collaborators. N Engl J Med 2000;34:1693-701. Browner WS, Pressman AR, Nevitt MC, Cauley JA, Cummings SR. Association between low bone density and stroke in elderly women. The study of osteoporotic fractures. Stroke 1993;24:940-6. Bonithon-Kopp C, Scarabin PY, Taquet A, Touboul PJ, Malmejac A, Guize L. Risk factors for early atherosclerosis in middle - aged French women. Aterioscler Thromb 1991;11:966-72. Talbott EO, Guzick DS, Sutton-Tyrrell K, McHugh-Pemu KP, Zborowski JV, Remsberg KE, et al. Evidence for association between polycystic ovary syndrome and premature carotid atherosclerosis in middle aged women. Arterioscler Thromb Vasc Biol 2000;20:2414-21. Mathews KA, Owens JF, Kuller LH, Sutton-Tyrrell K, Lassila HC, Wolfson SK. Stress-induced pulse pressure changes predicts women's carotid atherosclerosis. Stroke 1998;29:1525-30. Banerjee TK, Das SK. Epidemiology of stroke in India. Neurology Asia 2006;11:1-4.